I had so much fun tracking analytics during Texas Tech’s Big 12 run, I decided I’ll do the same thing for their NCAA Tournament Region. As most of you know, I primarily looked at BPI during conference play which wound up being quite accurate. In fact, of all the publicly available analytics models, BPI did the best against the spread. This is mostly in line with how the sportsbooks in Las Vegas have the matchup. The consensus in Vegas is Texas Tech -1350 (one would need to bet $1,350 to profit $100) and Northern Kentucky +885 (one would need to bet $100 to profit $885). The implied odds that each team will win the game are 93 percent for Texas Tech and 10 percent for the Norse. The spread is Texas Tech -14.5 (or close to it depending on which sportsbook you look at), meaning they are favored to win by 14.5 points. West Region BPI (predicted margin of victory against average team on neutral court) and national BPI rank. Furthermore, BPI provides odds for each team to reach each round of the tournament. I’ve listed everybody’s odds here until the point that they dip below 2 percent. Note: The 11 seeds (Arizona State and St. John’s) have significantly lower odds due to the fact that they play each other to see who makes the Round of 64. So they need to win two games to reach the Round of 32 while everyone else needs to just win one. Note: The 8 and 9 seeds’ (Syracuse and Baylor) odds drop drastically compared to everyone else’s due to the fact that they’re very likely to be paired with Gonzaga in the Round of 32. This is where it’s probably beneficial to be more of a 10-12 seed than an 8 or 9. Everybody else’s worst case scenario is better than yours (they don’t have to play Gonzaga), and your best case scenario (getting to play the 16 seed) is nearly impossible, while everyone else may luck out and play an underdog like an 11 or 12 or even 13 seed in the second round. 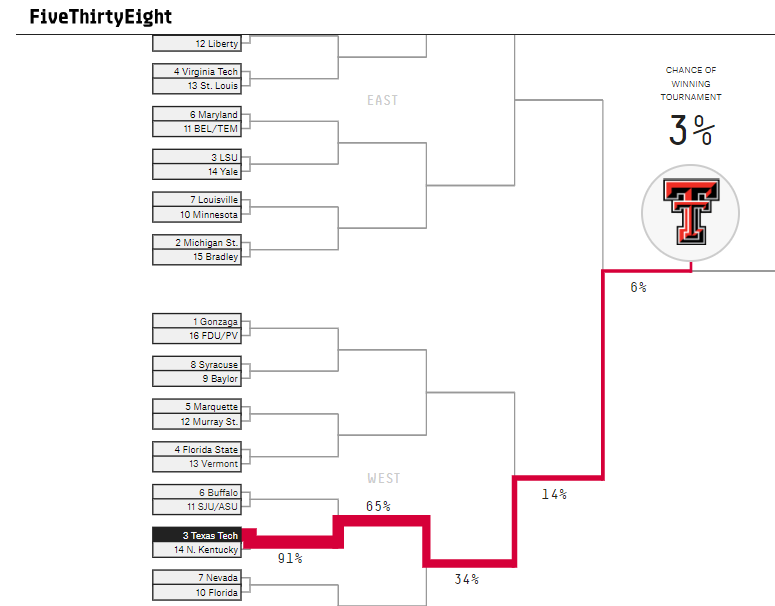 Here’s a cool graphic (which you can play with for any team here) with Texas Tech’s odds to advance to each round according to FiveThirtyEight. Like we all knew would be the case coming in, Gonzaga is a heavy favorite and it is reflected by these models. However, there doesn’t appear to be much separation between Texas Tech and Michigan according to all the models, so there may be some legitimate hope for another Elite 8 appearance if Tech plays well. If these models are accurate on Gonzaga’s odds to reach the Final Four, they’re a great bet in Vegas at +160. You’re basically betting on turning $1 into $2.60 for something that has (according to the models) a coin flip chance of happening per FiveThirtyEight and nearly two in three odds of happening per BPI. Take that every time. Also never gamble. There will be a quick turnaround in between the Round of 64 and Round of 32, but I will try to post another article with updated odds. Thinning the field will change things no matter what, but a major upset could really alter these probabilities moving forward.